Seven Days Blogs: Freyne Land: And the point is? i hope that someone runs against Symington in her home district and she is defeated!! 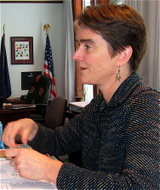 she is so ineffective, does exactly what shumlin tells her to do and it is a losing agenda all the way. guv. jimmy always gets what he wants even with a huge disadvantage in the legislature.. Shumlin will have his hands full this fall because rep. daryl pillsbury is running against him and sen. jeanette white.. shummy is vulnerble and can be beaten down here in windham county!! how sweet would that be?? the man who wants to be gov. but doesnt have the balls to go up against the all powerful Jimmy D!! Shummy has been searching all over the state trying to find a sacraficial lamb to run against Douglas, so far with no luck!! hopefully the people of windham county will send putney pete back to putney and outta the senate!!! I think "ineffective" is an understatement. Calling for a veto override and not being able to get all of your Reps in the house is a joke. I believe a reason was that one was on vacation out of the country. Not being able to count votes or schedule a time when you know you will have enough is incompetence for a Speaker. 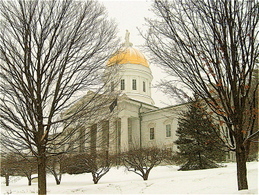 "And despite their currently significantly superior numbers under the Golden Dome, Democrats have still been unable to deliver on the core issues they told Vermont voters were their priorities: major healthcare policy reform, serious climate-change legislation and major campaign-finance reform." Um, just a suggestion . . . howabout they focus exclusively on local stuff, like, oh, I dunno, maybe fixing roads and bridges and school finance reform and regulatory reform so that local businesses can continue to do business here (or even expand!)? Nah, what was I thinking. El Guapo, what's even worse then that is she spent the 50K+ knowing that they couldn't override the veto, but did it "to exercise" the legislative process. Thanks Gaye...next time you want to exercise something pay for it yourself. is anyone in speaker gayes home district reading this blog?? is there any hope that ms. gaye will have competition in the nov election?? Symington will be re-elected by a landslide. I don't think she should be contested for her seat, but rather her gavel.